Agra, Amsterdam, Auckland, Auschwitz camp, Austin, Bangkok, Barcelona, Beijing, Berlin, Boston, Brasilia, Brussels, Bucharest, Budapest, Buenos Aires, Caen, Cape Town, Chicago, Copenhagen, Dallas, Detroit, Doha, Dubai, Dublin, Frankfurt, Giza, Hanoi, Helsinki, Hong-Kong, Hollywood, Houston, Indianapolis, Istanbul, Jakarta, Kansas City, Karachi, Kiev, Kuala Lumpur, Las-Vegas, Lille, Lisbon, London, Los-Angeles, Madrid, Manama, Manila, Mecca, Mexico City, Monterrey, Montreal, Moscow, New-Orleans, New-York, Normandy, Oslo, Paris, Philadelphia, Pisa, Prague, Pyongyang, Quebec, Rio, Rio-Antirrio, Riyadh, Roma, Rotterdam, Rushmore Mount, Saint Petersburg, San-Francisco, Santiago, Seattle, Seoul, Shanghai, Singapore, St-Louis, Stockholm, Sydney, Taipei, Tel Aviv, Tokyo, Toronto, Venice, Vienna, Warsaw and Washington. Sagrada Familia Basilica of Barcelona, Spain, National Centre for the Performing Arts of Beijing, China, One Kansas City Place of Kansas City , USA, Saint Sophia Cathedral of Kiev, Ukraine, Place Ville-Marie of Montreal, Canada (Rebuild), Abraj Al-Bait Towers - Royal Clock Tower of Mecca, Saudi Arabia, Gran Torre of Santiago, Chile. Alvear Tower of Buenos Aires, Portside Tower of Cape Town, Tornado Tower of Doha, Chase Tower of Indianapolis, World Trade Center and Torre Mayor of Mexico City, Kingdom Centre of Riyadh and Tokyo Tower of Tokyo. 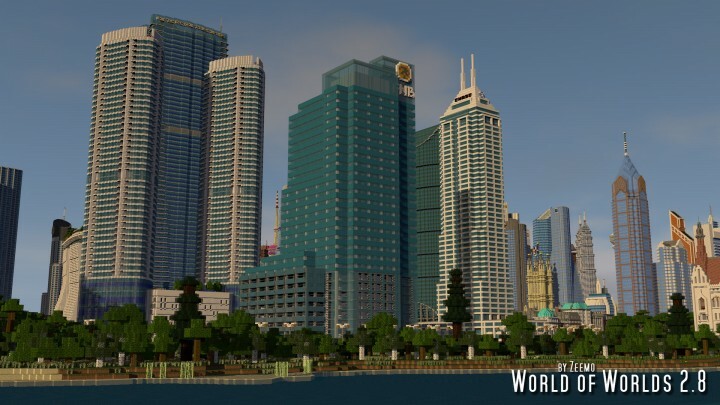 Geldersekade in Amsterdam, World Trade Centre of Bahrain (Manama), River South Tower of Bangkok, Hungarian Parliament of Budapest, Nyhayn canal of Copenhagen, Bahria Icon Tower of Karachi, Barcode Project of Oslo, Gamla Stan of Stockholm and Kirya Tower and Azrieli Center Tel Aviv. Freedom Tower and amazing Coney Island Cyclone roller coaster of New-York. Reichstag parliament of Berlin, Old Town Square of Prague, Vienna museum, Market Place of Warsaw, the Auschwitz concentration camp, Normandy American cemetery, Jewish cemetery of Warsaw, JU 87 bomber squadron, boats of the Normandy landings. Now, you can also visit Hanoi in Vietnam : complex of 3 huge towers; Keangnam Hanoi Landmark Tower. Thank you ! :) Great work btw. Is it for the 1.7.10? Or just for the 1.12 or 1.13? Bro give the man some time. Do you know how long it takes to build these things? I don't know if you remember me but we used to talk a lot back in 2017. I kind of stopped playing Minecraft and went on to Fortnite and CSGO lmao :) I just wanted to stop by and say hi since this map brings back memories lol. Did you stop making this because the most recent update appears to be one I remember. Anyways, I just wanted to say hi. Hi. Oh, I think I remember us talking about that. I hope you do good on it! You're not obligated to talk to me but I kind of wanted to keep in touch :p I hope if you have time you could do that Hallgrímskirkja church in Reykjavik, Iceland. I think we were talking about that earlier. Lmao I never thought of that. Just wanted to tell you I'll be sure to download the new version! Yeah please do the Hallgrimskirkja if you have time, my friend who has Icelandic grandparents wants to see it lol. But take your time. Also I just wanted to let you know Malwarebytes is blocking the download link. Oh lol, don't worry about it. Idk if you have Malwarebytes installed or not, I guess it doesn't really matter if it works for you. Are you going to post photos of the construction of the Nuechwenstein Castle on Google+? I'm curious because I know you used to do that like with the Sagrada Familia. 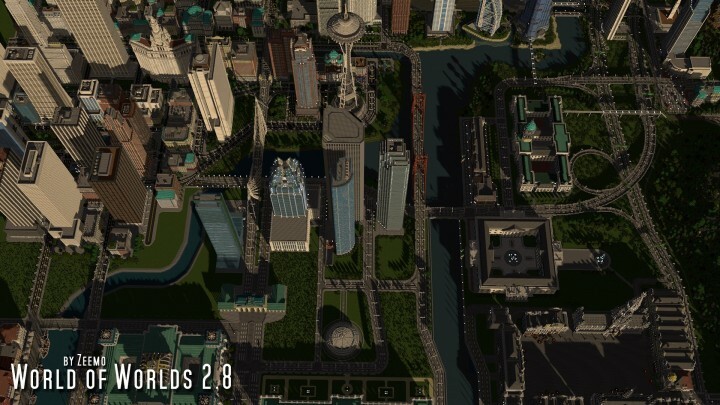 can i use a city to battle royale map? 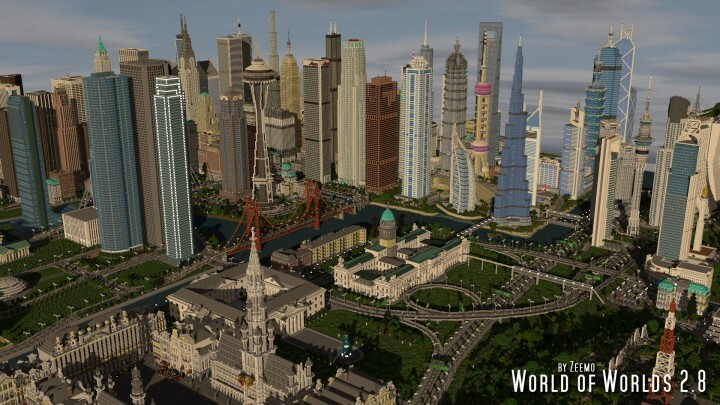 No problems my friend :D Just have to indicate "From World of Worlds Map created by Zeemo"
puoi costruire e aggiungere alla mappa il progetto di vita cittadina e le sue tre torri di Milano? 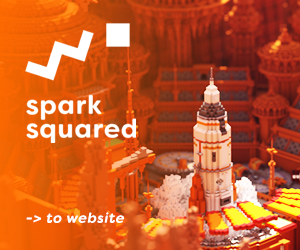 You are a amazing builder. Thank you for this map. 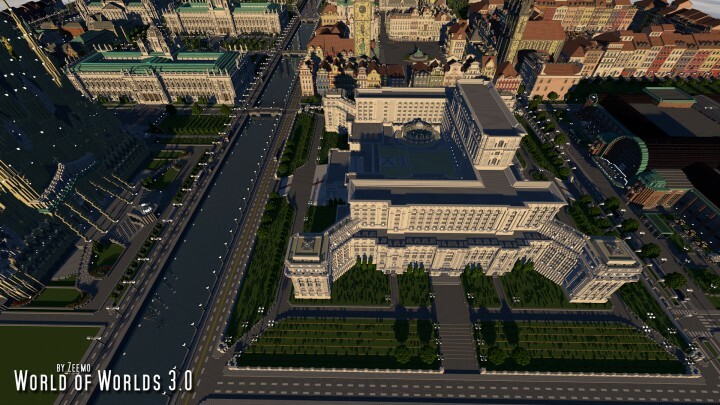 Can i ask, are there interiors for the buildings too? Still waiting for captial city of Slovakia Bratislava. You should add a message board in the world showing who teh creators are. I would add that to the world. 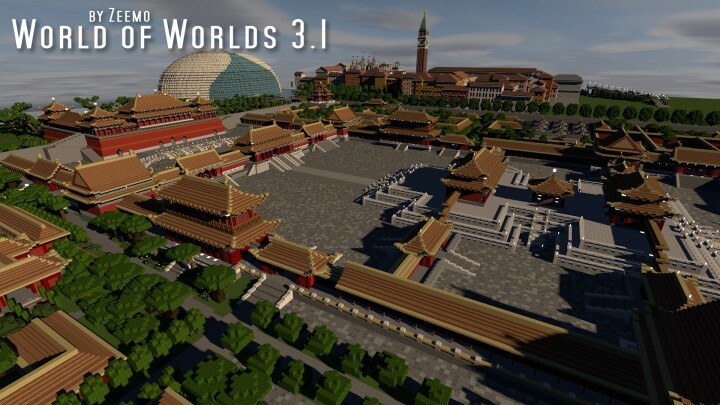 We are running World of Worlds v3.1 ... awesome hard work guys! We are looking for some people to be admins and join us in this awesome world! Can I port the map to Bedrock/Pocket Edition and upload it? Of course I would give credit to you. Cool ...you can use an AD.FLY link ...that give you money ...not to become rich ...but that's cool!!! Is this buildings from around the world??... Is there any from Indonesia??? Yes my friend, you can see monuments or buildings from more than 85 cities! Ah.. Thanks for the info, i though that UFO is the part of the landmarks or something 😅.well..is there any update soon especially for jakarta buildings/landmarks?? 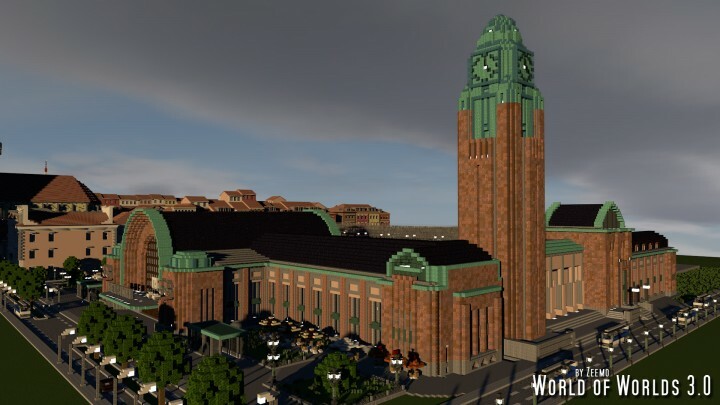 World of Worlds have been updated 2 weeks ago ...so no more release before a while for this map. 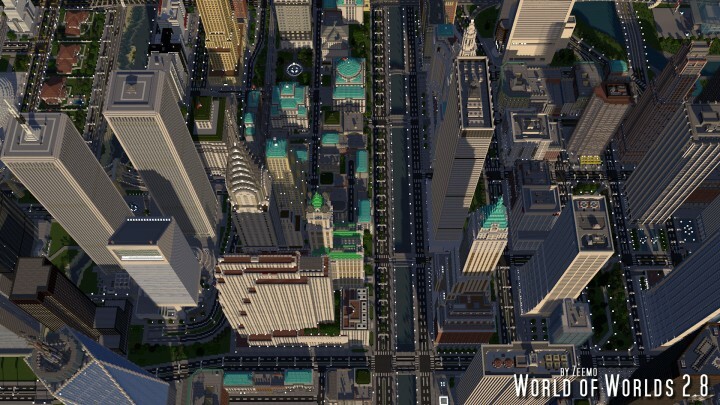 I will release a new version of Future CITY 4.5 soon. Ach so... Well, i'll see it. 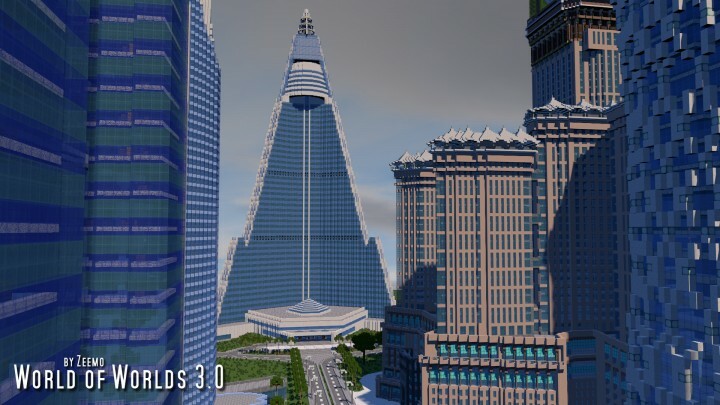 CN Tower is done since a long time ...see at 3:01 in the World of Worlds 3.0 video. 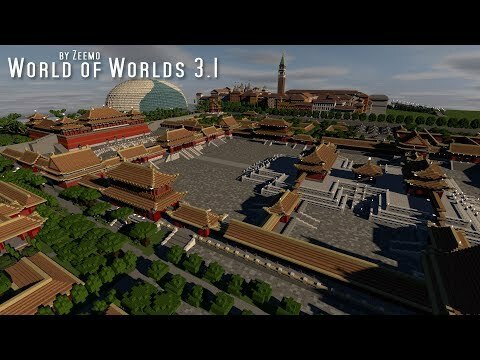 I already put online World of Worlds 3.1 ...Special China ...The Forbidden City! Do you use a program like Mineways to select a part of the map? Right now I have been using various apps or have been trying to put it from the zip file copied directly to Minecraft (which has worked for other worlds) but it is not working for this world. I know the map is huge, but I really want to explore and see how cool this is. Not sure if it will be possible or if you know of any other way to help. Can you add the Rock of Gibraltar and the Moorish Castle in Gibraltar? Anytime would be good, whether it takes 5 months or 4 weeks I don't care.